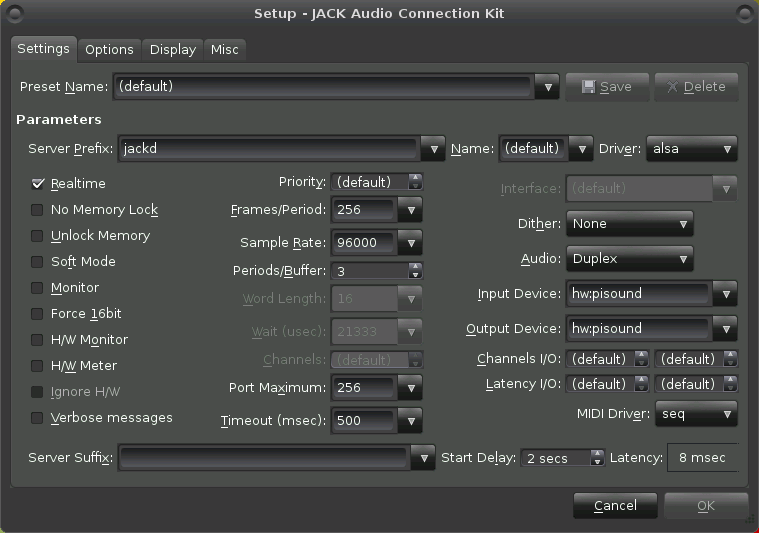 How to start Jack Server for Pisound? How to use Sonic Pi with Pisound? How to send WiFi-MIDI messages to your Raspberry Pi? Run QJackCtl (either from the Applications->Sound & Video menu or executing 'qjackctl' in a terminal. Input Device and Output Device both are set to 'hw:pisound'. If everything is fine, you should see 'Started' text written at the top left corner of the status area. Note: If something goes wrong, try different settings in Setup, and make sure that the sound card is not being exclusively used by some other software. The latest version of Sonic Pi works out of the box without any manual changes! Just start it from the menu -> Programming -> Sonic Pi! Triple-click the button on Pisound to enable the WiFi hotspot mode, touchosc2midi starts also. Connect to "Pisound" WiFi access point using a phone or a tablet, using 'blokaslabs' as the password. Open TouchOSC, MyOSC or similar app on your external device. Note: If you want to to control Pd patch with Wifi-MIDI messages, after completing the steps above, insert a USB stick with your patch files into your Raspberry Pi and click the Pisound button once to launch the patch! Dedicated topic for FAQs - Pisound Docs page.